We occupants of the Okanagan are dependent on an elaborate life-support system that maintains the air we breathe, regulates temperature, supplies reserves of food and water and shields us from deadly radiation. This system, provided by nature free of charge, offers a broad array of critical services: purifying the air and water, maintaining soil fertility, decomposing and detoxifying wastes, recycling essential nutrients, stabilizing the climate, protecting us from the sun's ultraviolet rays, mitigating floods and droughts, pollinating our crops and controlling agricultural pests. The world's soggy realms, called wetlands ­ transitional zones between chronically wet and predominantly dry environments ­ are often considered worthless real estate, yet they filter and clean our water, mitigate the effects of floods, and offer a home to a variety of plants and animals that cannot thrive on dry ground. Although the services afforded by wetlands are generally taken for granted, every wetland acre is more valuable than any other in terms of ecosystem benefits. Wetlands are biodiversity havens, providing breeding grounds and habitat for a wide variety of birds, fish and other wildlife. Wetlands enhance water quality by filtering out pollutants, sediments and nutrients that overflow a river's banks. They also limit flood damage by providing a buffer that can hold floodwater and delay its return to a river. In October 2011 we produced a preliminary 24-page report outlining our research to date, and our going-forward plans for the project. A PDF version can be downloaded here, and an online-readable version is provided below. This website is an updated version of that report, and we will be actively continuing our documentation and publishing process going forward. 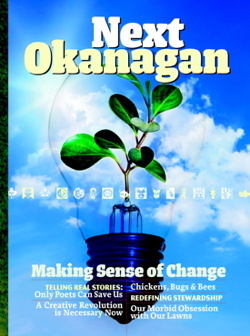 5000 copies of the report were printed, and inserted in the Making Sense of Change issue of the Next Okanagan journal, information about which is available here. Wetlands cover about six percent of the Earth's land surface. They come in all shapes and sizes, and have identifiable characteristics, such as the presence of standing water, unique soils formed by the decomposition of plant matter, and vegetation adapted to chronically wet conditions. Simply put, they serve as intermediaries between aquatic and terrestrial realms, sharing some features of each. 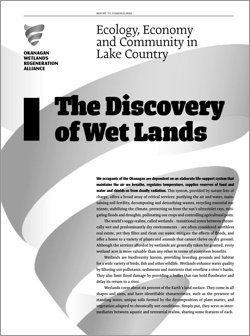 The Okanagan Wetlands Regeneration Alliance was formed to apply the principals of ecological regeneration to the wetlands of the Okanagan Basin, which are the source and heart of the future of human habitation and economy of this area, and which are in desperate need of understanding and regeneration. Our work has only begun.